This sticker shows three portraits of a woman's face progressively getting darker. Finally, in the bottom picture the face is no longer visable and has turned into a black figure holding a sleeping child. The portraits are all set against a red background with a purple border representing violence and women's rights. 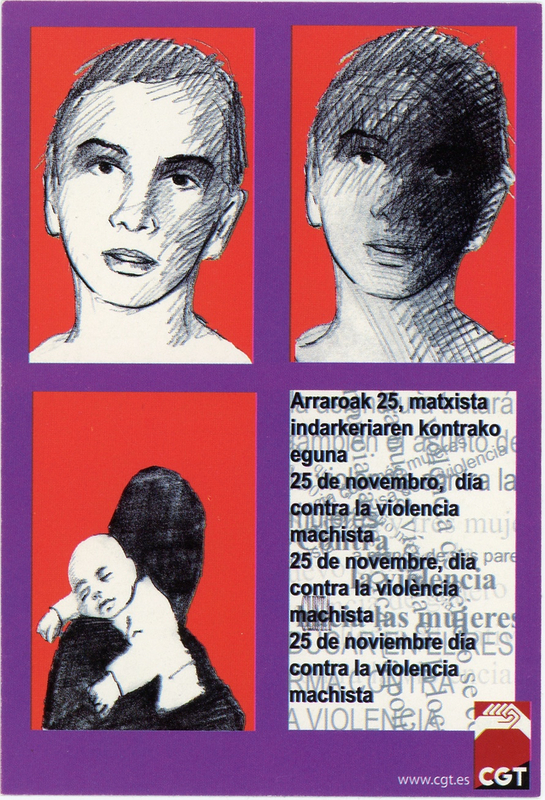 In the text on the bottom right the phrase, "25 De Noviembre, Día Contra La Violencia Machista," meaning "November 25, Day Against Gender Violence," is repeated in 4 different languages commonly spoken in Spain. By writing the phrase in more than one language, the sticker can reach a wider audience in spreading awareness about gender violence. It was produced by the Confederación General del Trabajo, the largest anarchist trade union in the world and one known for fighting against inequality between men and women; this is just one of many stickers they have incorporated to help the cause.